The schedule for the Empowering Women Through Secularism conference has been updated. The schedule follows. Changes, items different from the conference website, are bolded. 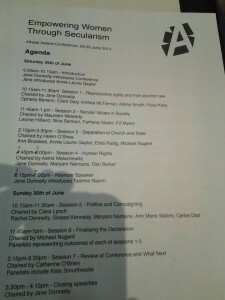 Note time changes, chairs of panels, and introductions. Wasn’t Rebecca Watson meant to be on one of the panels? I’m not objecting to her not being on a panel, just seems a little odd. She wasn’t able to make it. That’s a Double-A roster of speakers; but Watson, with no credentials to speak of other than having a blog, doesn’t even belong in semi-pro ball. Only one track? This must not be a very large conference — Justin, do you know or can you estimate the # of attendees? Interested in reading your reports as the weekend unfolds — would like to know more about who is attending, where they’re from, and what brought them to the conference. One track – about 200 attendees, from a quick headcount. Please tune in to Brave Hero Radio for more information!